The new map window has a number of new features. It can tell you about terrain (including landscape and buildings), landscape alone, popular places, places where you can buy land, and places where there are objects for sale. This is the popularity map: popular areas are highlighted in white. The green dots are avatars. 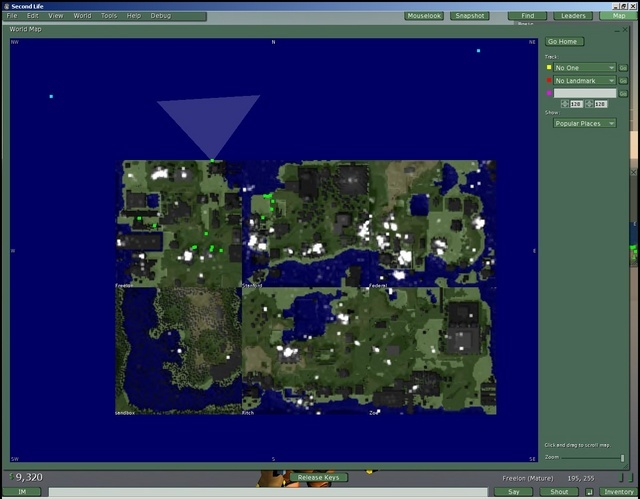 Notice the terrain features: buildings are shaded by height, giving the map a very realistic LANDSAT-like appearance.